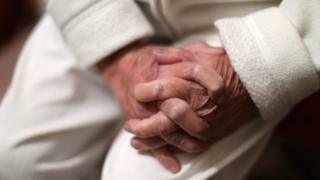 Scotland's care homes are facing growing staff shortages, according to a survey of care providers. Figures released by Scottish Care suggest three quarters of homes (77%) have vacancies. Almost nine in 10 (89%) of care at home and housing support services had positions lying empty. The Scottish government said it was committed to raising the status of carers and developing new models of care provision. Scottish Care, which represents independent care providers, said staffing problems were contributing to hospital bed blocking. The survey consulted 250 care services looking after 250,000 older people. A quarter of care homes surveyed found it more difficult to recruit care staff this year while 64% found it as difficult as the previous year. The survey, carried out in January and February this year, found more than one in five (22%) of staff leave each year on average and 44% of the homes rely on recruiting support workers from the European Union. The position for care at home services was similarly bleak, with 90% of organisations reporting difficulty filling support worker vacancies. More than half (58%) said recruitment is harder this year than last and only 3% said it was easier. A third of staff leave annually and around one in 10 of all staff are from the European Union. Scottish Care chief executive Dr Donald Macaskill said the "worrying" results had been worsening since 2015 and were leaving gaps in care and increasing delayed discharge from hospitals. He said: "The recruitment and retention crisis facing the care sector makes the planning and delivery of reliable, high quality and sustainable care very difficult for care providers. "However, it also means that individuals in receipt of services have their choices compromised, whether that is in terms of who they want to deliver their care and when, or whether they even receive a care service at all. "We know that the lack of staff is directly impacting on services' ability to support people most in need, including those who are ready to be discharged from hospitals. "Providers are regularly having to turn down care packages because they simply do not have the staff to deliver this care." He said the introduction of the Scottish Living Wage of £8.45 per hour for care workers last October was a first step by the Scottish government but more needed to be done. He added: "The social care workforce must be seen as a key national and local political priority. We can see no other profession which is so critical to the lives and wellbeing of so many, but which is so under-recognised and under-valued. "If this doesn't change, the future of care provision looks very bleak indeed." Health Secretary Shona Robison said: "Raising the status of social care as a profession, and attracting and retaining the right people, is key to delivering quality care. "That is why we have taken action to protect care services, including paying the Living Wage to adult care workers, boosting the income of up to 40,000 people. "In the coming year there will be almost half a billion pounds of NHS investment in social care and integration, underlining that we are treating this as a key priority. "We are also working with Cosla [local government organisation] and care providers to deliver major reforms to adult social care, which will consider workforce issues and new models of care and support."